U.S. Representative Kent E. Keller (1867-1954) began his political career in 1913, when he was elected to the Illinois state senate. Although he only served a single term, his voting record supported progressive legislation like old-age pensions, women's suffrage, and the eight-hour work day. He continued to be active in the Democratic party in Illinois throughout the 1920s, and in 1930, following the collapse of the economy in southern Illinois, his progressive views finally secured him election to the U.S. House of Representatives. One of the major planks in Keller's campaign platform was the need for a large-scale public works and relief program as the only means of redressing the economic disaster of the Great Depression. In 1932, during his first term, he introduced a bill outlining a national old-age pension program. Although his bill never made it to the floor for debate, the measures show Keller's concern for the economic and social security of the working class. This interest, however, was coupled with a strong dislike for federal borrowing and debt. 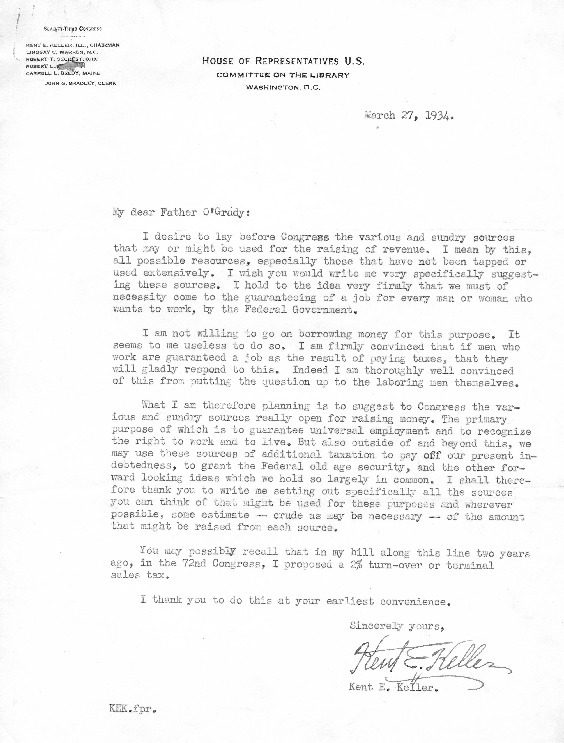 This letter from 1934 demonstrates both aspects of Keller's thought, and illustrates how the ethical impulse in favor of social security programs had to be coupled with practical ideas for funding the national system. The letter asks O'Grady for suggestions of sources that Congress to tap in order to generate more revenue. What were Keller's two priorities for using new sources of revenue? Keller mentions his 1932 bill calling for a social security program. How did Keller propose that his program would have been funded? How does Keller describe the attitude of laborers towards taxation that would guarantee employment and old-age security? Do you think his assessment of their attitude was reasonable? Why or why not?